Well...we all know how tough it is to go from a peaceful week of relaxation back into the frying pan (although - I can't really say the tour is equivalent to a frying pan). Ahhhhhhhhhhhhhh...a week off was exactly what I needed before picking the Experience Tour back up again. Today the Experience Tour is in Denver and tomorrow we're off to Houston! 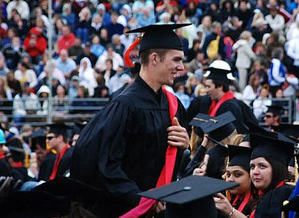 Congrats Justin!!! We are so proud! Did you listen to my latest Tips and Tricks Video from last week? It talks all about the world of Workspaces which can definitely save you time (and aggravation). 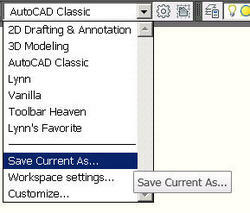 More importantly - for you on AutoCAD 2009 - it shows you how to get your user interface back to "AutoCAD Classic". This removes the new ribbon interface and puts back your pull-down menus and toolbars. Can't find the Workspace toolbar in AutoCAD 2009? The Workspace icon is now located in the lower right corner of the status bar. Essentially - Workspaces are a snapshot of your user interface. You can save as many different workspaces as you like. For example - you may choose to have different toolbars on your screen when you're working in paperspace than you do in model space. No problem - save a workspace for model space and then save one for paper space. Then it's simply a matter of doing a quick pick to jump from one to the other. And finally...key in the name for your shiny new workspace! Be sure to listen to the video...that's really your best bet to fully understand. You'll hear that my dog Tiffany was sick while I recorded the video...the poor thing overdosed on dry dog food and was sick for two days! Oh dear...bad dog parents...she won't go near the stuff now.